If this card is Synchro Summoned: You can target 1 Tuner in your GY; Special Summon it in Defense Position, but negate its effects. You can only use this effect of “Martial Metal Marcher” once per turn. 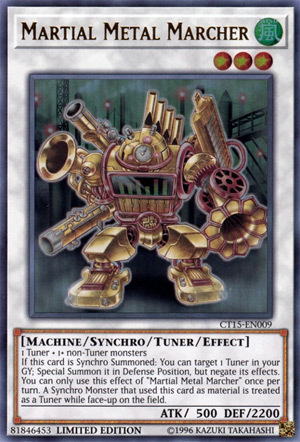 A Synchro Monster that used this card as Synchro Material is treated as a Tuner while face-up on the field. Alliteration is the theme for Martial Metal Marcher. Level 3 Synchros aren’t the most popular to summon, even if they are also a Tuner, so they’d better be packing some awesome effect(s). Reborn a Tuner in your grave, maybe the one you use to summon Marcher, no effects and in defense. Marcher makes whatever Synchro Monster is summoned using it a Tuner as well, but rarely will that come into play for anything important. The reborn effect can be nice, but you can’t Synchro with two Tuners alone, you need another monster. If you have two monsters on the field you are likely to get a Link Monster on the board and not a Level 3 Synchro monster. It works for decks that need two Tuner monsters for a Synchro monster summon. The card needs Crystron Needlefiber to be better, and we don’t have that yet. I think I don’t like this card. Martial Metal Marcher is a Level 3 Wind Machine-type Synchro Tuner Monster with 500 Atk and 2200 Def. It is generic requiring only 1 non Tuner and 1 Tuner to properly Synchro Summon. After properly summoning, you can revive a targeted neutered Tuner monster in Def Position. With MMM and a new tuner, there are a few monsters you could go into, but you would still need another non-tuner on the field. As a bonus, you treat the Synchro Monster that used MMM as material as a tuner. I think that’s just too many tuners to be useful. I think the forcing of your Synchro Monster to be a tuner should have been optional. I even think the Atk should have been 1500-1700. Instead Martial Metal Marcher makes for a moderate score. Next up for promos is probably one of the more interesting of the promos in the Junk Speeder tin, Martial Metal Marcher. MMM is a Level 3 WIND Machine Synchro Tuner with 500 ATK and 2200 DEF and requires 1 Tuner and 1+ non-Tuners. ATK is low, but DEF is high and funny enough Stardust Assault Warrior from yesterday can’t pierce through this, being a Level 3 Synchro is typically going to be a Tuner as well, WIND again is meh but Machine is great. If this card is Synchro Summoned, you can target 1 Tuner in your GY and Special Summon it in Defense Position with its effects negated and this is a hard once per turn effect for Martial Metal Marcher. Well this would be cool if we had Needlefiber, but any sort of revival is nice plus having an extra Tuner can help for future Synchro plays. A Synchro monster that uses this card as Synchro material is treated as a Tuner while face-up on the field. Sometimes you never know when you’ll need a higher level Synchro Tuner, but this won’t do too much sometimes and in rare cases might hurt you if you need to Synchro Climb but only have Tuners in your hand, but that is a rare case that I wouldn’t worry about. Martial Metal Marcher is a cool card that will be much better with Crystron Needlefiber, but is solid as it stands. Art: 4.25/5 Looks like an older Symphonic Warrior. Martial Metal Marcher…say that three times fast…this Monster is unique, to start, being just a Level 3 Synchro (still being generic needing a Tuner and one or more non-Tuner Monsters for a Synchro Summon) and being a Synchron Tuner Monster itself, which is the real gem of this card, at least on the surface. The 500 attack won’t do squat, but the 2200 defense can work for you, as well as being a Machine. So, if this card is Synchro Summoned, you can Target and Special Summon a Tuner from your Graveyard. Said Tuner is Special Summoned in Defense position to your Field, and has its effect(s) negated. The effect, as you might guess, is once per turn, but it’s still an extra Tuner for you, and that’s good. If you use M3 for a Synchro Summon, he passes on his Synchro Tuner ability, and that Synchro Monster also becomes a Tuner. Which can be useful, definitely. There are a number of higher Level Synchros that do require you do use a Synchro Tuner Monster specifically, and it’s certainly easy enough to bring out M3, and since he all ready gives you a Tuner via his effect, there’s no reason you can’t go to play and bring out a Monster of that nature. It’s not game breaking, but it does something, and what it does, it does well enough.